We head north from Huaraz until we reach the village of Cashapampa. From there we begin the hike to the Santa Cruz valley and continue until we reach our camp in Llamacorral. We pass by the two lakes of Jatuncocha and Arhuaycocha to the ravine, and then reach the trail to Base Camp. From Base Camp we continue along the glacial morraine to the glacier,, where we push onwards to High Camp. This day requires an early sart, where we climb the Quitaraju hill and gain the north wall to reach the summit. After soaking in the views, we return to the High Camp. We will leave early after breakfast to the Base Camp, and enjoy the scenery of the surrounding mountains. 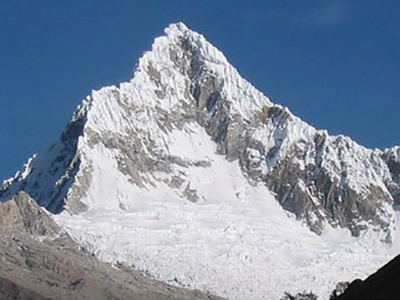 We will walk to the village of Cashapampa where we take the bus back to Huaraz. Day 7: Extra day in case of bad weather.